← Queer Country Quarterly on September 2nd! 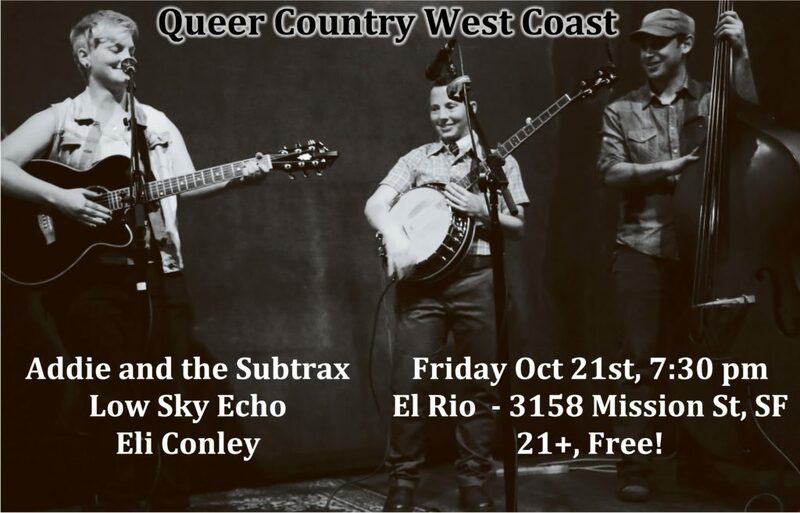 Queer Country West Coast returns to El Rio is San Francisco with our Fall Edition on October 21st. We’re pleased to feature Low Sky Echo, an Oakland-based indie Americana band comprised of veterans of the Bay Area music scene. Jackie Strano once fronted The Hail Marys and The Passengers, Hilary Reed produced Twang for several years, and Kevin and Kerry Stamps hail from Mobius Donut and The Passengers. Addie and the Subtrax combine folk, blues and bluegrass to create a show that will have you clapping, swaying, and ruminating over their honest and exposed lyrics. Expect layered harmonies and tugs on your heart strings from songwriter Addie Liechty and her band of compatriots. Plus, your host Eli Conley is getting ready to go into the studio to record his second full-length album, and will have some musical treats to share with you!